Computer Club: Like the final round of a videogame tournament, Computer Club’s music is loud, aggressive and spattered with grimy funk. A tendency toward the heavy, distortion-tinged sound of electro house is well balanced with his penchant for funk-laden interludes amongst the banger blitz. 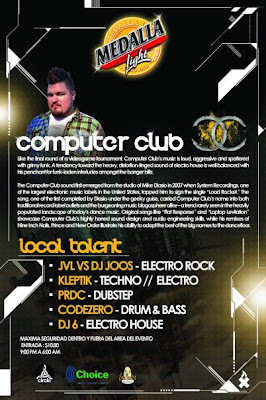 The Computer Club sound first emerged from the studio of Mike Diasio in 2007 when System Recordings, one of the largest electronic music labels in the United States, tapped him to sign the single “Load Rocket.” The song, one of the first completed by Diasio under the geeky guise, carried Computer Club’s name into both traditional record label outlets and the burgeoning music blogosphere alike – a trend rarely seen in the heavily populated landscape of today’s dance music. Original songs like “Flat Response” and “Laptop Levitation” showcase Computer Club’s highly honed sound design and audio engineering skills, while his remixes of Nine Inch Nails, Prince and New Order illustrate his ability to adapt the best of the big names to the dancefloor. Along with his impressive studio output, Computer Club is a well-accomplished DJ by any measure. His steady stream of gigs has him traveling to every corner of North America with regular stops in New York City, San Francisco and everywhere in between. From rocking a 30,000-strong crowd at L.A.’s Nocturnal Festival to dropping an intimate set for his former home of Atlanta, Computer Club constantly exhibits his deftness and versatility behind the decks. 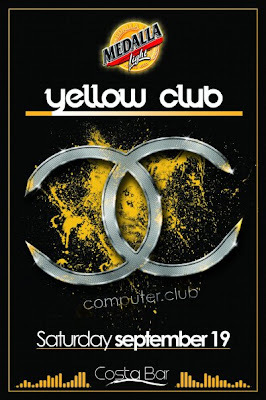 While recent releases such as a remix of Mr. Oizo’s “Flat Beat” and his re-working of Konflict’s legendary Drum & Bass anthem “Messiah” with fellow producer/DJ Le Castle Vania have helped propel his name to new heights, Computer Club has started working on his debut album. Tentatively titled “Nerd Secrets,” the full-length promises to showcase a wide swath of musical styles, ranging from dancefloor-filling, hands-in-the-air bangers to straightforward rock songwriting to experimental weirdness. In addition to his newly-minted Computer Club moniker, Mike continues to push the boundaries of dance music as one third of Evol Intent, a hard-hitting Drum & Bass trio considered by many fans and DJs alike to be the UK-rooted genre’s most talented American group. Initially known as purveyors of the toughest brand of D&B, their debut album “Era of Diversion” exhibits a musical variety influenced by everyone from Radiohead and Aphex Twin to Slayer and N.W.A.